In the secret language of exterminators, "perimeter pests" or "occasional invaders" refers to that wide variety of insects and related arthropods that occasionally get into homes, like the millipede on the right. 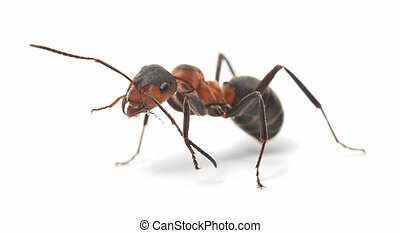 By definition, these pests usually live outside the home or building, and only occasionally make their way inside. Here's another little exterminator secret for you: Most of these pests will die on their own once they make their way inside. They need a higher moisture level than exists inside most homes (unless, of course, there's a moisture problem in the house, in which case all bets are off). Most of the time, however, pests such as sowbugs, pillbugs, and most millipedes will dehydrate and die once they get inside, with or without treatment. There are a few exceptions to this rule. For example, crickets, earwigs, silverfish, firebrats, and some centipedes often can survive inside a house, especially in dark areas where they are seldom disturbed. Control of these pests sometimes requires some trapping or some limited use of insecticides or baits inside the home. But the main treatment should still be done outside because that's where they came from. There are many insects and arthropods that occasionally make their way into homes in Dayton and elsewhere in Ohio's Miami Valley. Here are some of the more common ones. Millipedes. The picture on the top of this page is of a millipede, which is an arthropod with many legs -- two of them for every body segment, in fact. They're not insects because insects, by definition, have only six legs in their adult stage. Millipedes like living under rocks, rotten wood, mulch, and in other places rich in organic matter. They're beneficial inasmuch as they help return the things they eat to the soil. But although they do love moist environments, they are air-breathers; so when the the soil gets soaked with rain, they sometimes make their way inside to avoid drowning. The problem is that usually it's too dry inside for them to survive, so instead of drowning to death, they die of dehydration. You might say they're between a rock and a dry place. Centipedes. Centipedes are arthropods with a bunch of legs, but they only have one pair per body segment. That's still a whole bunch of legs, and they know how to use them. They tend to move pretty quickly. Unlike insects, centipedes lack the waxy coating on their bodies (called the cuticle, in case you're interested) that helps insects maintain their bodily moisture. As a result, they prefer moist habitats such as leaf litter. But some species are able to survive inside homes, especially in basements, if they are not disturbed and have ready access to food and moisture. It's rare for there to be enough centipedes inside a home to justify interior chemical treatment. Usually if any insecticides are going to be used, the exterior is where they'll do the most good. The centipedes that are inside usually can be more effectively dealt with using sticky traps. There are some exceptional cases, but they're just that: exceptions. Some centipedes are able to bite. Their bites can be painful, but are seldom harmful. A few people, however, are allergic to centipede bites and can experience serious allergic reactions if they are bitten. Sowbugs and Pillbugs. Pillbugs (shown are the right) and sowbugs aren't really "bugs" at all. They're not even insects, for that matter, because they have more than six legs. They're actually crustaceans. Sowbugs and pillbugs like to live in very damp soil, under leaf litter, or in other places that are moist and rich in decaying organic matter. If you pick up a random rock in your yard or garden, chances are that you'll find sowbugs or pillbugs (or both) living underneath it. Pillbugs and sowbugs often get into basements or the first floor of slab homes, where they usually die from dehydration quite quickly. It's rarely necessary to treat the inside of the home in this case because, well, treating for something that's already dead doesn't make a whole lot of sense. However, because the number of sowbugs and pillbugs that make their way into the home -- and then die -- can be quite large, exterior treatment is often recommended once non-chemical control measures have been applied. We'll talk about that a bit farther down on the page. Firebrats and silverfish differ in their habitat preferences. Silverfish prefer damp habitats, while firebrats prefer drier ones. Either insect can become established in homes. Silverfish often nest inside wall voids adjacent to kitchens and bathrooms, which are made humid by condensation from the pipes. Firebrats are more likely to be found in the boiler room or in a hot, dry attic. Wherever they may choose to live, however, silverfish and firebrats started out as "outside" pests. Quite often they will nest under shingles on the roof or siding or shakes on the outside walls of the house, and eventually migrate inside. Their numbers can grow pretty large, pretty quickly; and although they're more an annoyance than anything else, they're a pretty big annoyance. Silverfish and firebrats can be difficult to treat once they get into a home. In fact, they can be pretty difficult to treat before they get into a home, especially if they're living under shingles or behind siding. This is one pest for whose control we really can't provide a price estimate without first inspecting the home because the difficulty of treatment can range from simple to nightmarish. Crickets. Crickets are common pests in Dayton and throughout Ohio's Miami Valley. One of the more common crickets encountered by Dayton-area exterminators is the cave cricket, shown on the right. A lot of times people call these insects "jumping spiders" because that's what they look like with those long legs, but they're not spiders. They're crickets. Cave crickets often nest inside homes, especially in basements, crawl spaces, under decks, or in other humid, dark spaces where they're generally undisturbed. They reproduce quite rapidly and their numbers can grow quite impressively. It's not unusual to find hundreds or thousands of crickets in (or under) a single home. Despite their ugly appearance and impressive reproduction rates, crickets are more of a nuisance than anything else. They don't cause any real harm, so there's no need to go all Rambo when treating them. Almost all of these problems can be taken care of by exterior baiting with borates or other low-toxicity baits, and glue boards in the areas where they're living. Once in a while, some light spraying in the area where the crickets are living makes sense, most often when the person living in the home is flat-out terrified of crickets. Anything much more than that is simply overkill for these insects. These are annoying, but harmless. In the vast majority of cases, exterior baiting and interior glue boards are all you really need. Other Occasional Invaders. There are many, many other occasional invaders -- far too many to discuss here. Some of the more common ones include earwigs, various kinds of beetles, ladybugs, slugs, snails, and others. Make sure that the ground immediately outside your home is well-drained and graded away from the home. Try to maintain at least eight inches between the bottom row of siding and the ground. Avoid organic mulches and promptly rake up fallen leaves. Maintain at least a foot of distance between plantings and your home. Keep the rain gutters clean and in good repair. Repair and leaks or moisture problems around the foundation, door sills, basement windows, etc. Make sure the basement windows and crawl space doors close tightly. Once all that's done, most likely we can prevent occasional invaders from occasionally invading by applying an environmentally-responsible product like a borate or other low-toxicity bait around the outside of your home, totally eliminating the need for interior insecticide applications. Dayton Pest Control provides high-quality perimeter pest control in Dayton and Ohio's Miami Valley, including the cities and towns of Beavercreek, Bellbrook, Blanchester, Brookville, Carlisle, Centerville, Eaton, Englewood, Fairborn, Farmersville, Germantown, Gratis, Greenville, Kettering, Lebanon, Lewisburg, Medway, Miamisburg, Middletown, New Lebanon, New Oakwood, New Vienna, Port William, Sabina, Springboro, Springfield, Trotwood, Troy, Union, Vandalia, Waynesville, West Carrollton, Wilmington, and Xenia; and the Ohio counties of Butler, Clark, Greene, Miami, Montgomery, Preble, and Warren.